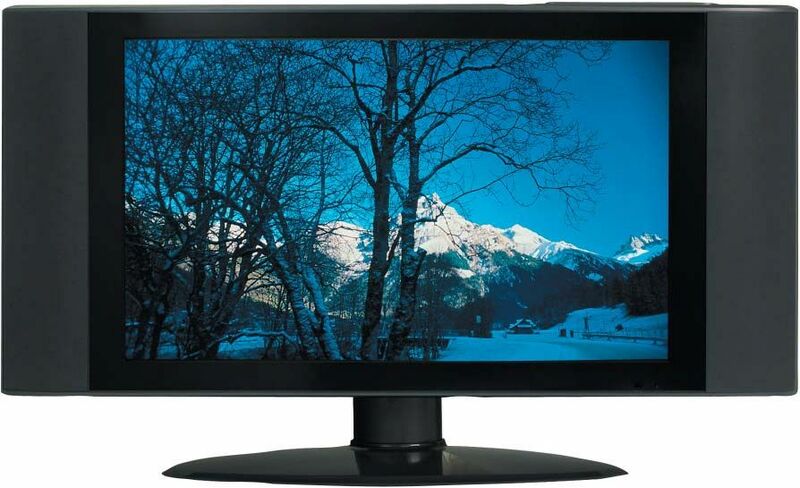 The 32-inch Proview RX-326 ($949.99 list) is an LCD TV that offers high-definition resolution at an affordable price. It produced some of the most eye-pleasing imagery we've seen on a TV at this price, but our lab testing revealed some quirks that will disappoint video purists. We found the RX-326's dark gray bezel and matching, ellipse-shaped table stand attractive in an understated way. The TV's side-mounted speakers are not removable, but provided decent sound quality with no signs of clipping at maximum volume. Its simulated surround-sound mode was quite effective at creating a sound field that seemed to emanate from all directions. The A/V inputs on the RX-326 are grouped on a downward-facing, recessed panel on the rear of the display. The selection of connections includes an HDMI input, a component input, and a VGA connection for use with PCs. The lack of an over-the-air HD tuner technically makes the RX-326 an "HD Ready" TV, but a NTSC tuner is provided for standard definition analog reception. The LCD panel used in the RX-326 offers a native 1,366- by 768-pixel resolution. Though home theater PC users can drive the RX-326 using either the HDMI (using a DVI-to-HDMI cable) or the VGA input, only the VGA input eliminated overscan (extension of the edge of the picture beyond the active portion of the display) without requiring adjustments in the video card's driver control panel. The RX-326's slender remote control has curved edges that make for comfortable single-hand operation. It lacks a backlight or glowing keys for use in dimly lit environments, but every button was clearly labeled, and the layout provided ample tactile feedback. The controls on the display are conveniently located on the top right edge of the TV. The RX-326's menu system provided resolution and signal information for selected inputs. We were disappointed, however, to find that using the component input disabled hue (tint) adjustments, and using HDMI input disabled all the picture controls except brightness and contrast. Our subjective viewing examinations included the use of DVD videos, Windows Media Video HD movies, and standard and high-definition over-the-air TV. The RX-326 generated the most compliments among our viewers when compared side by side with LCD TVs of a similar price and size. We did notice some slight banding in scenes containing finely graduated light-to-dark transitions, such as the river flyby in the opening scene of The Magic of Flight (WMV HD) and the scene in The Fifth Element where Bruce Willis awakes in a dark room lit only by red light, but that artifact wasn't overly distracting and was almost unnoticeable at appropriate viewing distances. LCD TVs in the RX-326's price range typically use an older LCD technology that isn't so adept at maintaining good color saturation when viewed at an angle. Though the image is usually visible even at extreme angles, it can appear washed out; viewing the RX-326 from more than 20 degrees off center in any direction made colors look noticeably faded. Other similarly priced LCD TVs we have seen typically start to fade around 30 degrees. The latest LCD panels, which are more expensive, can be viewed at 50 or 60 degrees before colors fade. In the lab, the RX-326's warm-color-temperature preset produced colors that came closest to the standard used in film and video production. Unlike other LCD TVs, such as the Vizio L32 or the Westinghouse LTV-32w1, it didn't suffer from degraded color quality when using component video input. We measured the RX-326's contrast ratio at 595:1 (ANSI checkerboard test pattern), just above average among LCD TVs. Its average bright value was comparable to the best LCD TVs we have seen, but the more important average dark level was a bit brighter than we would have preferred, making black appear grayish in dimly lit environments. Unfortunately, the RX-326 lacks a backlight adjustment, which will optimize an LCD TV's light output to suit the conditions in the viewing environment. We use the HQV Benchmark DVD to gauge a television's video-processing capabilities. This DVD contains a challenging array of synthetic and real-world video tests designed to evaluate how well a television handles common video-related tasks such as deinterlacing, noise reduction, and detail preservation. The RX-326 failed to engage 3:2 pulldown properly for film-based video (24 frames per second), producing visible moiré artifacts and losing detail. With film-based DVD videos such as Gladiator, we noticed significant flicker in scenes containing fine detail and motion. This issue can be resolved by pairing this LCD TV with an upconverting DVD player that performs proper 3:2 pulldown. The RX-326's adjustable noise-reduction function was a rare find for an LCD TV at this price, and though not perfect, it eliminated most noise without significant blurring or loss of detail. The RX-326 offers HD resolution at an affordable price. The Vizio L32 has more input options and the Westinghouse LTV-32w1 offers more comprehensive image controls with all A/V inputs, but our eyes preferred the image quality and consistent A/V input performance of the RX-326 to those of other LCD TVs in this price category.